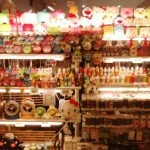 Fancy buying cute but affordable lights- with cartoon images like Doremon and Hello Kitty? This store is located in front of Carrefour hypermarket in Mid Valley Megamall, Kuala Lumpur. It also sells mini fans. But if you do visit night markets or the pasar malam, you can also get similar items.